Sunday morning we worshiped at the Baptist church in Montalvo. The members there were so welcoming and the worship was inspiring. Singing How Great Is Our God in Spanish with our new Ecuadorian friends brought many of us to tears! After the service we were able to witness the baptism of a new believer. What a privilege to be present at such a special time in this young man's life. In the afternoon we went to Banos and saw many waterfalls. 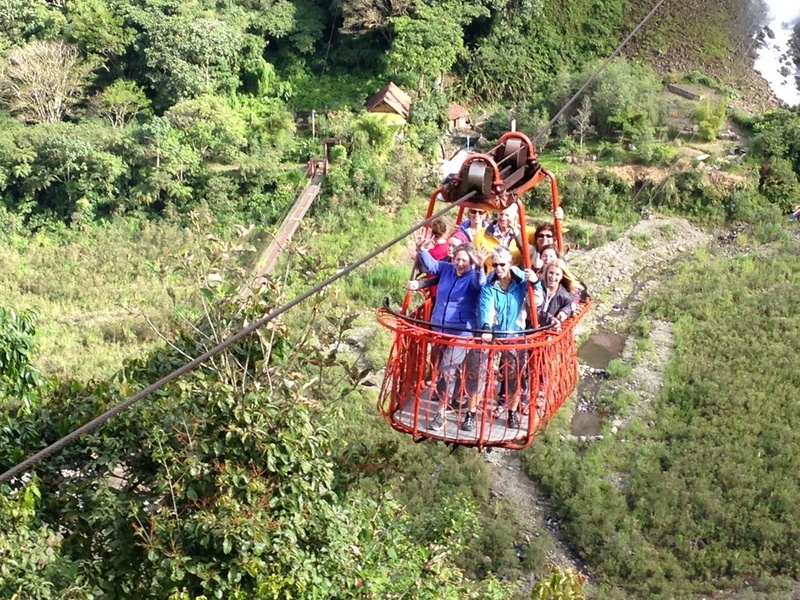 Some of us took an exhilarating ride across a gorge--over 300 feet above the raging river. Yikes! We pray that the Spirit will empower us to witness with boldness. Wherever we may be, may He flow out from our inmost being as refreshing rivers of living water, meeting the needs of others. Help us depend on Him as we pray, counting on His presence within us, interceding for us and along with us. Older PostEcuador: Adult Trip-Better Late Than Never!